Of all the places I most enjoy in New York’s Capital Region, few surpass the Albany Pine Bush. When I was new to the area, hardly a day passed that I didn’t pack my young toddler, Kayla, into the Kelty carrier so that I could explore the hiking trails with my Yellow Lab, Mowgli, by my side. Then Kayla outgrew the carrier, and when her brother, Alex, came along, leisurely dog walks grew more infrequent and less pleasurable. Back in 2008, on my first blog, I shared the tale of the day that I decided to return to the Pine Bush with my family for a hike that turned out to be more of an adventure than what we had bargained for. 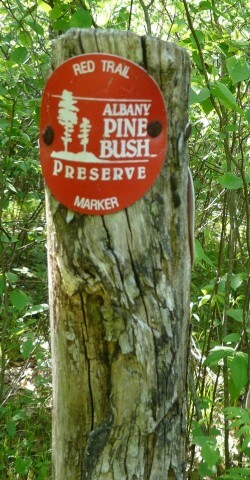 When we returned to the Pine Bush, we were confident, repeat visitors. Sure, it had been several years since we had set foot in the Rensselaer Lake section of the park, but with marked trails, who needs a map? It really shouldn’t have been a difficult to complete the 2 mile loop on the trails as they were well-trod and liberally labeled with red trail markers. My husband, Dave, and our Chocolate Lab, Yoohoo, led the way; while Alex and I followed, stopping frequently to admire the vegetation. Perhaps we were a little too caught up in trying to identify mysterious flora. 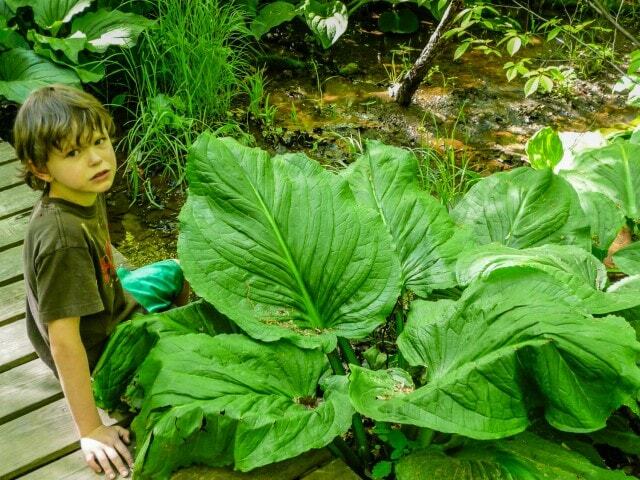 We found these curious pink sprouts on leaves in one spot, and mammoth primeval water plants–possibly skunk cabbage–in another. Somehow in the midst of our impromptu Botany lessons, we lost site of those markers. All true, but we hadn’t taken into consideration that we were circumnavigating a lake. After trudging along for what seemed like hours, we found ourselves gazing wistfully at our trail – on the other side of the lake! Not ready to swim the distance in the murky water, we were forced to turn around and head back to the mid-point of the loop where we had last seen those red markers. It took a little more pleading than usual – and promises of jumbo-sized ice cream – to keep Alex trotting along. He had been ready to turn around at the one mile mark, and he certainly hadn’t expected the 3-hour-tour. 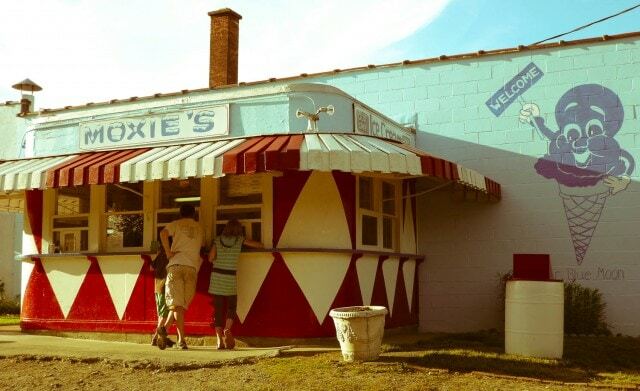 Luckily, Alex really loves ice cream, enough to keep him moving at a fast clip in hopes of ending the day at our favorite ice cream stand, Moxie’s, a road side ice cream stand that looks like it was transported from the Happy Days set. Bypassing the international vanilla sampler– my palate isn’t sophisticated enough to appreciate the subtle differences between Haitian or Venetian Vanilla – I ordered the Espresso Mocha, with crunchy bits of espresso beans. Alex wend for his plain chocolate, Kayla enjoyed the real strawberries in her ice cream, and even Dave – who never likes sweets – agreed that this was one of those not-to-be-missed pleasures in life. Slowly savoring our ice cream cones, we headed to the playground. It’s gorgeous, full of retro equipment, but I wondered how they’ve avoided a lawsuit. Even as I thought this, a child banged her mouth on a metal bar. Not a big deal, but surely a risk in our litigious society. Meanwhile, I couldn’t help noticing a neon blue ice cream cone in the child’s hands. It was so bright, so unreal. Moxie’s signature flavor is difficult to describe, and supposedly only found in the Upper Midwest of the United States (although there have been reports in other states.) The Chicago Tribune has described Blue Moon ice cream as “Smurf-blue, marshmallow-sweet, and tasting remarkably like Froot Loops and Fruity Pebbles”. That description doesn’t do the ice cream flavor justice–ambrosia is what comes to mind. But don’t take my word for it. Try it for yourself. Trust me, it’s a worthy reward for a journey into the Great Outdoors. If you like ice cream, you’ll love the Capital Region Ice Cream Tour on All Over Albany. ‘I don’t need the map.’ is one of those famous last words which seem to tempt fate – you’d probably have never needed it if you had it! Luckily, ice cream is the perfect motivator. Even if it is blue. Gotta remember to strike that phrase from my repertoire! The promise of ice cream would have been the only thing to keep either of my kids going on a trek like that too! !